Get Involved! Volunteer form Right Here! 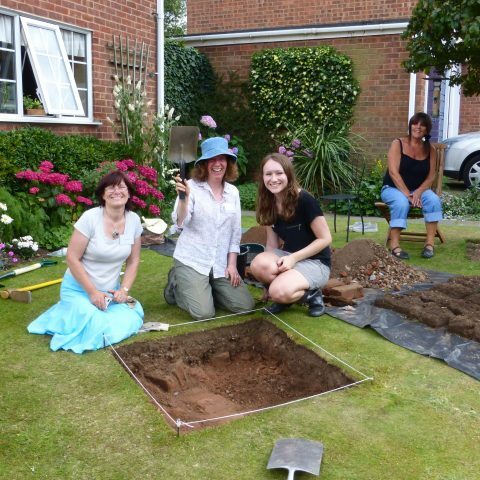 Test Pit Dig – Reports! Watch this space! Exciting plans for 2020 and 2021 to 2023 under construction! For some time the Market Bosworth Society have been aware that very little is known about the development of our town during the period of 400 AD through to the 11th century. We know something about our history thanks to various finds in Bosworth which include man made flint tools giving evidence of prehistoric occupation, a Bronze Age cinerary urn and axe head, the remains of a Roman Villa and many other Roman finds around Market Bosworth which indicate that the Roman occupation of Bosworth was not simply centred, as Peter Foss has suggested, on Barton Road but was more substantial. Significantly, there is no evidence of Anglo Saxon occupation although St Peter’s Church is believed to stand on an earlier Anglo-Saxon church and in John Nichol’s book on Leicestershire Antiquities he makes mention of a chapel dedicated to St Ann, which possibly predated the Church, sited on the hill to the north of Bosworth but no evidence of its existence has ever been unearthed. In April 2016, the Society was addressed by Peter Liddle, a recognised expert on Anglo Saxon settlements. In explaining the rise and decline of medieval villages he made mention of a programme of systematic test pit excavations, being led by Professor Carenza Lewis, which are producing significant evidence of the spread of Anglo-Saxon occupation inland from the east coast. He suggested that if the community were interested in discovering its early history then a programme of test pit excavations in Market Bosworth carried out by the community was the ideal way forward. The Market Bosworth Society’s Committee created a sub-committee to investigate the feasibility of such a programme. As a result of this Bosworth Links was formed with its logo of a chain not only depicting our history going back unbroken to the 11th century where it breaks around the time of the Domesday Book. But furthermore, it depicts the intention of the Market Bosworth Society to use this initiative to bring together representatives of the whole community, irrespective of age or ability, in a community led project to extend the unbroken length of chain. So what is community test pit digging? Basically, it is the creation of teams, who do not require any archaeological expertise, to dig pits a metre square and to a maximum depth of one metre. Soil is removed in 10cm layers which is then sieved and any evidence of manmade material is put to one side for further examination. The team consists of four people. A digger who loosens the layer of soil, a person who removes the soil and takes it to the person sieving and finally a recorder who lists the items found for each layer and ensures it is bagged up with the correct reference number. It is hoped that the home owner who has agreed to allow the pit to be dug on their property will recruit their own team from family members and friends. Any shortfall will be covered by volunteers from elsewhere. It is the intention to dig twenty-five pits over the weekend of the 22/23rd of July 2017 and a further twenty-five pits will be dug on the 21/22nd July 2018. The three schools in Market Bosworth are very enthusiastic about the project and have agreed to involve their students in the proposed digs within the school grounds. 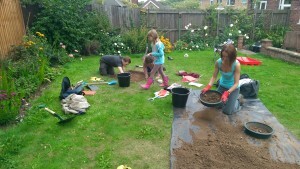 This phase of the project will take place in school term time and will not be part of the community dig weekend. Whilst we have said that participants do not need any archaeological expertise the project will be carried out according to the regional framework and agenda and therefore must meet the necessary standards to ensure that the results are meaningful and can form part of the national research programme. 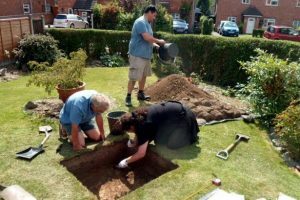 The work will be carried out under the overall supervision of the University of Leicester Archaeological Services led by Mathew Morris MA AIFA. Mathew is well known as the archaeologist who decided where the first trench in the car park was to be dug and consequently was the first person to see part of Richard III skeleton. On completion of the dig Mathew Morris will prepare a report which reviews the results of the dig and draws conclusions on the early history of our settlement with possible recommendations for further archaeological research. For you the project offers an opportunity for some hands-on archaeology in the company of your family and friends. Acquiring new skills and furthering your understanding of the history and heritage of Market Bosworth. Any finds, and there will be some, can be returned to you if they are not of such significance that would warrant them to be housed in a museum. For the aged there is the opportunity to join in with the community in a worthwhile project. For the children, there is a practical learning opportunity which will benefit their broader curriculum requirements. In feedback from participants in similar projects, such as that at Rothley, they all said that above all the weekend was fun packed, not at all arduous, they have made new friends and they were proud to have made a positive contribution to the history of their village. Don’t forget to ‘like’ Bosworth Links on Facebook and follow us on Twitter!